Remember the 1960s? The 1970s? Back then, inflation surged from one peak to another but failed to deliver the low unemployment rates promised by the Phillips curve. In fit of frustration, economist Arthur Okun invented what he called the misery index—the sum of the inflation and unemployment rates. As the chart shows, those were miserable years indeed. Today we don’t hear much about the misery index. True, the index hit a 20-year peak in the depths of the Great Recession, but people hardly noticed. Now it is back to a relatively comfortable level and still headed down. 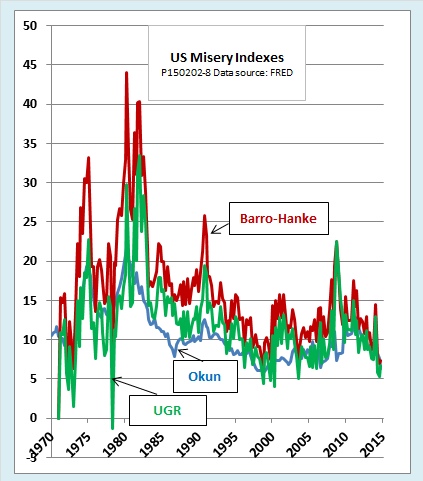 In an era of chronically low inflation, Okun’s index just isn’t miserable enough to make the headlines. Couldn’t we add something to spice it up a little?